Distributed Control Applications: Guidelines, Design Patterns, and Application Examples with the IEC 61499 discusses the IEC 61499 reference architecture for distributed and reconfigurable control and its adoption by industry. The book provides design patterns, application guidelines, and rules for designing distributed control applications based on the IEC 61499 reference model. Moreover, examples from various industrial domains and laboratory environments are introduced and explored. Alois Zoitl earned his master’s degree and PhD from the Vienna Institute of Technology. He currently leads the Industrial Automation Research Group at fortiss GmbH in Munich. Before that, he headed the Distributed Intelligent Automation Group (Odo Struger Laboratory) at the Vienna University of Technology’s Automation and Control Institute. Dr. Zoitl is an active lecturer at the Technical University Munich, co-author of 100+ publications, co-inventor on four patents, founding member of the 4DIAC and OpENer open-source initiatives, member of the IEEE and the PLC open user organization, consultant for CAN in Automation, and member/convenor of IEC SC65B/WG15 for the IEC 61499 distributed automation standard. Thomas Strasser earned his master’s degree and PhD from the Vienna University of Technology. He is currently a senior scientist in the Energy Department of the AIT Austrian Institute of Technology. Before that, he spent more than six years as a senior researcher at PROFACTOR. Dr. Strasser is an active lecturer at the Vienna University of Technology, guest professor at the Salzburg University of Applied Sciences, co-author of 120+ publications, recipient of two patents, active participant in IEEE conferences, associate editor of Springer and IEEE journals, senior member of IEEE, founding member of the 4DIAC open source initiative, and involved in IEC SC65B/WG15, IEC TC65/WG17, and IEC SyC Smart Energy/WG6. 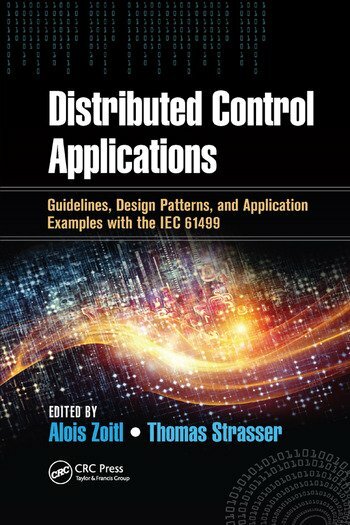 "… presents an interesting, pragmatic point of view of the use of the IEC 61499 standard for the design of distributed control applications, including examples ranging from industrial cases to laboratory automation case studies." "… intuitively understandable. I like the approach from basics, over design principles, to testing/verification/fault-tolerance, and finally concrete application examples. The real-world examples are highly inspiring and one could learn a lot from the discussed concrete steps and appropriate setups." "… provides very thorough, encyclopedic coverage of the methodologies and application of the emerging function block standard IEC 61499. … The scope of topics being covered in this book is very impressive. … It can bring anyone working in the area quickly up to speed. … a useful reference." "The main strength of the book is the broad coverage of the IEC 61499 standard and the involvement of so many experts as authors. … The content is well thought out and covers more than I've ever seen in a book on industrial programming. … easy to read … very comprehensive and instructive … will become a standard reference for IEC 61499." "This is probably the first book about the IEC 61499 standard that completely focuses on application development, gathering the experience of first-class scientists and engineers who developed and maintain the standard itself and apply it in very different domains. Industrial control application designers and developers, who already know the IEC 61499 basics, can find very useful design, development, test, verification, and reengineering guidelines. Descriptions of various industrial and laboratory applications provide practical examples of solutions based on the philosophy of this standard. A necessary guide in order to be up to date with the current state of the art regarding the usage of the IEC 61499 standard." "This book is a very good survey on current research on IEC 61499 and its application, and therefore a basic handbook for industrial engineers for their daily work with IEC 61499-based applications." "... presents a comprehensive overview of IEC 61499 and its development so far. In contrast to other books concentrating on the standard itself, this work concentrates more on new supplementary approaches, such as design patterns or unit testing with function blocks. Considering the latest initiative Industry 4.0, this book presents many key enabling technologies, such as fault-tolerant and self-configuring systems using IEC 61499."